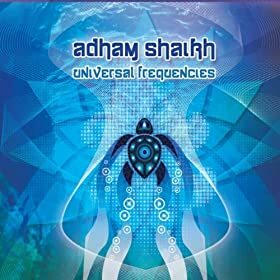 Adham Shaikh is a world beat electronic music producer from BC, Canada. He has been making music and DJing for 25 years, releasing 12 albums and countless singles and guest appearances in that time. He has produced and engineered albums, and scored original soundtracks for numerous film and television productions. Adham has been nominated for awards for his film scores as well as his albums. This newest effort will surely be nominated for a Juno, as it is his best album to date. Universal Frequencies has a more modern and funky feel to it than his previous release Collectivity. There are sounds of swing, gypsy, and balkan beats. The grooves had me and everyone else in the room dancing as soon as the first notes of each song started playing. It doesn’t take long for this music to get inside your head and body. The first song is appropriately titled “Crossroads- Part 1” and sounds like the Adham Shaikh songs from Collectivity. The second and third songs are two different versions of “Water Prayer”, each with a nice groove that gets you warming up to the fact that you will be dancing soon. The fourth song on the album is called “Carpet Breaker” and the fifth is “Rug Ripper” and yes, by the fifth song, you are ripping up the carpet… this is a funky dance album! The unique world music sounds combined with the high energy beats make for an amazing musical experience. Adham Shaikh is a true musical master who, with much thought and intention, takes you on an incredible journey from the first song to the last. Follow Adham on Twitter and Facebook.